Things don't have to be black or white - with dimmers and other various light controls, you can find an in between by simply adjusting the light levels on your fixture to suit your mood. At Lightology, our goal is simple: to be the premier contemporary lighting company for both homeowners and design professionals. 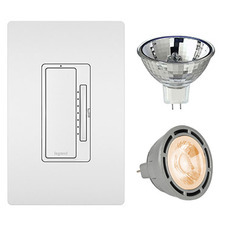 Lightology offers over 30,000 contemporary indoor and outdoor lighting products, including high & low voltage dimmers, 12 volt & 120 volt dimmers, incandescent dimmers, electronic and magnetic low voltage dimmers, LED dimmers and more! A wide variety of lighting sources exist on the market. These sources have individual characteristics which require special types of dimmers. It is important to use a dimmer that is designed, tested, and UL listed for your specific lighting source. There are following lighting sources: Incandescent, Magnetic Low Voltage (MLV), Electronic Low Voltage (ELV), Neon/Cold Cathode, and Fluorescent. Each source requires different dimmer. 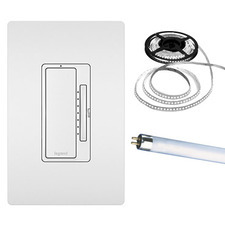 Single-Pole Dimmers provide control from one location. 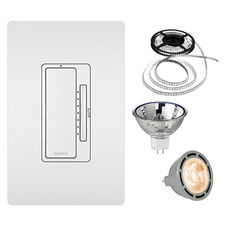 3-Way Dimmer with Switches - 3-way dimmer adjust the light level from one location. When used with 3-way and 4-way switches, the lights can be turned on to dimmer level or off from many locations. Multi-Location Control from Each Location - multi-location dimmers can be used with accessory dimmers for full control of the lights from up to 10 locations. Note: Only certain dimmers allow the ability to dim from more than one location—example: Maestro or Faedra. 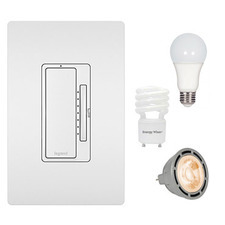 With other dimmers, you can only dim from one location and have an on/off switch at the other location. A typical dimmer is wider than a switch. This increased size helps the dimmer dissipate the internal heat normal to operation. Dimmers can be ganged together such that the space between them is the same as for switches. To do this, a portion of the fins (heat sink) must be removed. The fins are grooved to make the removal of fins easy with a pair of pliers. The removal of these fins reduces the capacity (load) the dimmer can control. For ganging and derating chart visit Lutron website. Do dimmers increase lamp life? Dimming increases incandescent lamp life, and halogen lamps are incandescent lamps. 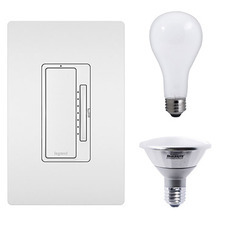 Lutron test data suggest that all halogen lamps will have an expected lamp life similar to that of other incandescent (non power factor corrected) lamps when dimmed, i.e. a halogen lamp dimmed by 25% has a life extension of about four times that of a non-dimmed lamp. Yes. If a product purchased as a 3-way control needs to be used in a single-pole application, cap off one of the traveler wires with a wire connector. Can I use a 3-way dimmer in the 4-way switch location? No. Multi-location dimmers do use standard 3-way wiring, but make use of one wire for communications while the other carries the load current. A 3-way switch is not compatible with this configuration. Transformers may have magnetic (core and coil, toroidal) or electronic (solid-state) clearly indicated on the product. However, this is not a required marking and will not be found on all products. The best was to determine transformer type is to contact the manufacturer. A hint of the transformer construction can often be found in the transformer's weight. Magnetic (core and coil, toroidal) transformers are often heavy for their size. Electronic (solid-state) transformers tend to be smaller and are often light for their size. What do I use for self-ballasted "dimmable" compact fluorescent lamps? Lutron does not currently offer any products UL listed for these devices. For fluorescent dimming, use a Lutron electronic fluorescent dimming ballast and a dimmer specially UL listed for use with that ballast.